Day 40...hard to believe it's been going this long. Spent some time on all my games this holiday weekend. The last week has been a busy one for upgrades; lots more done and this game is nearing max TH7 quickly. I've saved some bigger/longer upgrades for the end (hidden teslas, two levels of barracks, BK). Last week I ran a one hour boosted raiding session, but otherwise kept to my usual 15 minutes a day of play. I will do the same this week, but this upcoming weekend I might just put in an afternoon of raiding Saturday and Sunday to knock out walls. There are 175 walls altogether; at 200K per wall, that's 35M in gold. With any luck, I can drum up enough elixir to get the four barracks going and maybe move my BK to level 3 or 4 as well. I'm also debating when to start the TH8 upgrade. It takes 8 days to complete, so my inclination is to kick it off just as I start the teslas on their last upgrade. I'll upgrade spring traps and bombs during the time the TH is under construction, then hit THi offense hard. TH8 is where I switch my regular raiding army comps up. Right now, I've been using 8 Giants, 8 wallbreakers, and the rest a mix of barbarians/archers/goblins. Starting with TH8 maxed troops, I switch to 16 Giants, 12 wizards, 8 wallbreakers, and 4 healers. This allows for deeper penetration of stronger defenses and walls, all the way up through TH9. Progress from day one can be found throughout this thread. I try to get in once or twice a week to provide updates. For anyone interested in looking at the village directly, it is the player named, "Clash Maniac" on clan, "Divergent Void" (P8CGRG0C). Here are the current stats. Things keep moving along, slow but steady. The last week has been spent working on the air defenses, both ADs and AS. All four are currently upgrading to their TH7 max. I decided to tinker with some clan wars again and I've put all of my TH7 games into 10v10 wars. So far, we've had two perfect wars in a row and won both. The current one is against 10 games that are identical to each other (so one guy) with the exception of BKs. He has all level 1 troops except for dragons, so clearly he will be hitting me with dragon attacks here shortly. I upgraded one of my barracks to level 9 so I had dragons as well; it's tough hitting TH7 bases with no dragons. I'm finding Hogon (aka Dragon Rider) to be a solid attack for level 1 dragons and hog riders. The base is doing ok; three starred in one war, two starred in the other. Since I haven't been using this game for war, my upgrade focus has been very different than if I had. I've focused strictly on farming troops; as such, I didn't even have dragons until I started warring. Likewise, my air defenses were all still low and needed to be upgraded. (You don't see many air raids in normal farming.) A bit of a shifting of gears was necessary but we're looking good now. Naturally, I had to put in some time raiding for resources; level 9 barracks is 1.5M gold, level 5 ADs are 1.08M gold. This increased my play time a bit; instead of my usual 10-15 minutes each day, I had to put in a few hours last week raiding up resources. That said, I'm back to just hitting collectors again while I wait for all these upgrades to finish in a few days. Next up will be finishing off the remaining three barracks, my BK needs two more levels, the teslas will need one more level as will the DE drill. I should be able to knock those out fairly quickly this weekend into next week (builders free up in 3.5 days or so). Then I just need to rustle up 35M in gold to upgrade the walls (looks like I have a weekend raiding session in my near future) and I'll bump the game to TH8. By rights, all the non-wall upgrades will be done by end of next week, so I'll probably pull the trigger on the upgrade itself end of next week, if not earlier. On the side, I had started a defenseless base as an experiment. Sure as the day is long - I accidentally upgraded the cannon to level 2. SOOO...I decided to make that one a minimax of some kind and today started a new one to be defenseless. If SC ever changes the matchmaking algorithms, I'll end up re-engineering it to include defenses but, for now, I have TWO experiments going on the side. Wow - it’s been 12 days since my last update on the Clash Maniac game. I continue to perform upgrades while engaging in back-to-back clan wars. So far, the war base has performed fairly well and continues to fare better as I get things upgraded. It’s taking some time to max TH7 as I’ve been putting more resources into clan wars than the upgrades. I continue to maintain a relatively casual playing style, running the occasional raid to gather resources for upgrades and troops. At any rate, here are the current numbers…. Yup - I decided to pull the trigger on the TH8 upgrade. 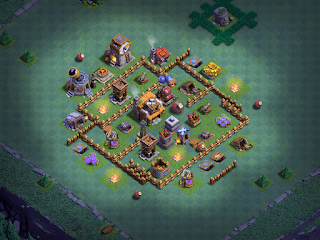 The game is well along in all areas, defense and offense, and TH8 is a good place to do some additional building. To say the least, I'm way overdue to get it started anyway (it's been two months after all). As soon as the builders free up again, I'll get those last two barracks upgraded and maybe raid some walls. Gotta hit some troops too, although farming troops are long since done and this game has been rocking the three stars on TH7 10v10 wars for weeks now. Under other circumstances, I would have started this upgrade a few weeks back, but then I got into some clan wars and needed another TH7 game to round out the 10v10 and well...you know how that goes. Of course,I have another TH7 in the wings...my defenseless just popped the TH7 mark and I should have it ready to war in a week or two. Journal of a Rusher - Updated!